When you shop the Everything Summer Camp Web site online Look for products tagged with the Smart Living icon. What is Smart Living? It’s the label we give a product that actually offers health benefits to the consumer. Simply click the Smart Living icon on the product you’re looking at and you’ll pull up an information box that describes, in detail, the health benefits of that product! A couple weeks ago I told you about the health benefits of water bottles. Today I’m telling you about fans. Staying cool in the blazing heat of summer is just as important to your health as staying hydrated and wearing sunscreen! Heat exhaustion, like dehydration and directly exposing your skin to the sun, is something that you want to prevent this summer. Heat exhaustion can be a consequence of sweltering temperatures, physical activities, or both. You’ll know you’re hitting the point of heat exhaustion when you get a headache and you’re sweating profusely, feeling weak, confused, dizzy, nauseous, and unquenchably thirsty. In the case of heat exhaustion, rest with some fans blowing on you. Your body regulates temperature using a few different methods. Fans help to regulate body temperature through a process known as convection. Convection is when air or water moves across your skin. Convection also aids in another temperature regulation process known as evaporation. As your body sweats during the process of evaporation it creates a humid layer on your skin. A fan will speed up evaporation by removing the sweat and replacing it with a dryer, and cooler, layer. You should also drink lots and lots of water and other fluids but no drinks with caffeine like soda or energy drinks as these beverages are known to make matters worse. When you have the energy to, take a cool shower. Everything Summer Camp carries a small collection of cool fans that you can use to prevent heat exhaustion from getting to you. Our Funky Flexi-Fan is fun to bend, turn, snake, and loop to give yourself just the right angle you need for optimum comfort. With a convenient clip, you can attach the Funky Flexi-Fan to just about any of your surroundings: the car, your camp bunk, the beach! Our Deluxe Fan/Light from Texsport is no ordinary fan. It doubles as a lantern so that you can give yourself some light in the same direction as the breeze! 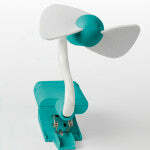 And lastly, you can give our handheld, Water Misting Fan a squeeze for a refreshing blast of cool, cool H2O! Adding a splash to an enjoyable summer breeze will really keep you comfortable on those summer camp scorchers. Simply squeeze the fan to mist yourself or give your camp buddies a playful squirt. The summer may get hot, but you don’t have to be. Check out our fun fans from Everything Summer Camp to help stay cool this summer.